Black Bean Fudge Brownies – as if you needed a reason to eat more chocolate, these fudge brownies are packed with fiber from the black beans. Easy to whip up, this recipe is a great way to treat yourself without overindulging! These were going to be chickpea brownies, but I used the chickpeas in a soup and decided to use black beans instead – it also made more since, I thought. And dear goodness, it did! 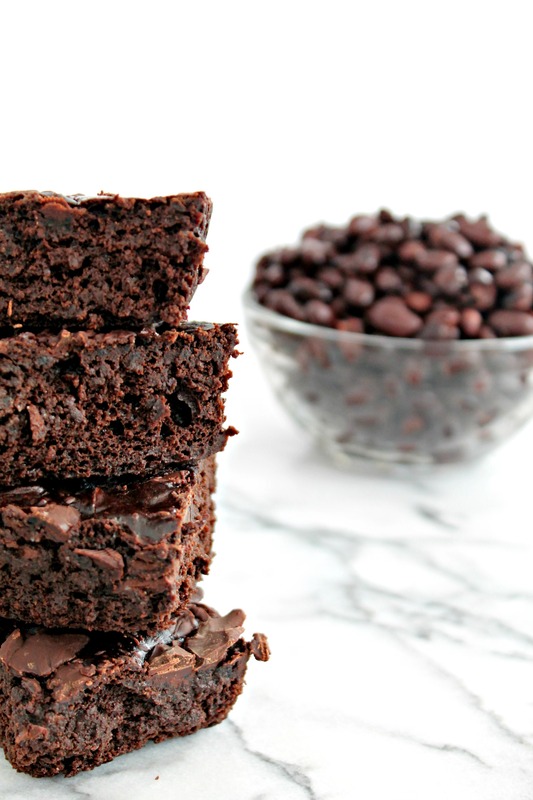 These Black Bean Fudge Brownies are chewy, gluten free, packed with dietary fiber, and might just become your favorite brownie recipe of all time. These are the perfect treat to tuck in your kid’s lunch boxes, as they’ll love the chocolate delight and you’ll be happy to know they aren’t eating a ton of crap. You can definitely make these the night before and let them chill overnight in the fridge for a cool chocolate treat – they do hold up better when they are cold. These are completely gluten free, but you can add 1/3 cup flour to this recipe to make them sturdier. The chopped chocolate on top makes them irresistible – don’t skip that part! You can use chocolate chips or chopped chocolate – whatever you have on hand. Go forth and bake my friends – brownies await! Have you ever baked with black beans? Let me know in the comments! These are gluten free and chocolate-filled brownies, packed with extra protein from the black beans! Preheat the oven to 350F and grease a square 8 by 8 baking pan. Place all the ingredients except the chocolate chips in the blender and blend for two minutes until smooth. Pour into greased pan and top with chocolate chips. Bake for 25-30 minutes and let sit for at least 2 hours (or even better, overnight!) before cutting.